Suzuki Kanon promoting "Utakata Saturday Night! / The Vision / Tokyo to Iu Katasumi"
Debut Single Maji Desu ka Ska! Suzuki Kanon (鈴木香音) is a former Japanese pop singer under Hello! Project as a ninth generation member of Morning Musume. She graduated from Morning Musume '16 and Hello! Project and also retired from the entertainment industry on May 31, 2016 in order to pursue a career in social work. Suzuki Kanon was born on August 5, 1998 in the Mikawa Province area in Aichi, Japan. On January 2, at the first Hello! Project 2011 WINTER ~Kangei Shinsen Matsuri~ A gana Live concert, Tsunku announced Suzuki as one of the new members of Morning Musume's 9th generation alongside Ikuta Erina, Sayashi Riho, and Hello Pro Kenshuusei member Fukumura Mizuki. That same day, Suzuki made her concert debut. In April, Suzuki debuted in the Morning Musume single "Maji Desu ka Ska!". Suzuki starred in a stage play titled Reborn ~Inochi no Audition~ along with Niigaki Risa, Tanaka Reina, the other 9th generation members, and Kudo Haruka. On January 13, the Morning Musume 9th generation and 10th generation members began a web talk show exclusive to fanclub members, titled Honki DE Hichou!. They also began a radio show on April 7, titled Morning Musume no Morning Jogakuin ~Houkago Meeting~, on Radio Nippon. On April 18, it was announced that Morning Musume's Tanaka Reina and the 9th and 10th generation members would star in a new musical titled Stacies Shoujo Saisatsu Kageki. The musical ran from June 6 to June 12. On May 13, information was released about an event featuring Morning Musume's 9th and 10th generation and S/mileage's 2nd generation, titled Mosuma FC Event ~Gachi☆Kira~. It took place throughout June and the beginning of July. On May 16, the Morning Musume 9th generation and 10th generation members' fanclub-exclusive web talk show Honki DE Hichou! ended with a total of 70 episodes. On August 5, Suzuki held a birthday event, titled Suzuki Kanon Birthday Event ~Oto no Kaori Yuku 15sai~ with the other "Team Green" members, Ikuta Erina and Sato Masaki, as guests. In 2014, Suzuki began appearing solo in various variety TV/game shows. She appeared on Quiz 30 ~Sanketsu Seyo~ on April 27 (alongside Tsugunaga Momoko) and May 18 (alongside Michishige Sayumi and Ikuta Erina), VS. Arashi on July 3 as a part of Team Pocchari (Team Chubby), Tsutaete Pikacchi on September 6 and DownTown (with Sayashi Riho) in September. On August 5, Suzuki held her 16th birthday fanclub event, titled Morning Musume '14 ~Suzuki Kanon Birthday Event 2014~. The event featured one performance at Yamano Hall in Tokyo, Japan. On October 27, during Michishige Sayumi's radio show Kon'ya mo Usa-chan Peace, it was announced that Suzuki would have her own radio show, later titled Itsudemo! Kannon Smile, on CBC Radio starting on December 2, replacing the former. On August 5, Suzuki celebrated her 17th birthday at a special event called Morning Musume '15 Suzuki Kanon Birthday Event, featuring two performances in Tokyo. On February 7, Suzuki announced she will be graduating from Morning Musume '16 and Hello! Project at the end of the Morning Musume '16 Concert Tour Haru ~EMOTION IN MOTION~. I, Kanon Suzuki, will graduate from Morning Musume。’16 and Hello! Project at the end of the Morning Musume。’16 Spring Tour. I became a member of Morning Musume。 I admired since I was small, and I believe through our activities we made many people smiled with our songs and performances. I do not know how far those feelings reached everyone but I really tried my best at the fullest. Since last year I seriously thought about my future, and since I was really small I thought "I want to help people" so from now on, what can I do? Every activities as Morning Musume。was meaningful and fun, and during one of them, the event "SATOYAMA movement", "SATOUMI movement", I have been in contact with people with a beautiful smile and I thought little by little it would be great if I can do the same work. There are many forms of "Being helpful to people"... but from now on, I feel strongly that I want to help people in another way, I want to make people smile, I want to make them happy. For this first step, I decided "I want a work related to the welfare" to go towards to my dream. For that reason, as a human I have to experience and study various things. I will continue Morning Musume。 activities to make those activies nourishe me, also to cherish the time as Morning Musume。 and to not forget the feeling of gratitude I receive from everyone. Thank you for your continued support towards Hello! Project and Morning Musume。'16. Kanon Suzuki, Morning Musume。'16 member, will graduate from Morning Musume。'16 and Hello! Project at the end of Morning Musume。'16 Spring tour. On May 17, Suzuki held a solo live, titled Morning Musume '16 Suzuki Kanon Solo Special Live, featuring two performances at IMA Hall. Fans could win an invitation to the special live by entering a lottery when they purchased the "Utakata Saturday Night! / The Vision / Tokyo to Iu Katasumi" box set via forTUNE music. The last broadcast of Suzuki's radio show Itsudemo! Kannon Smile was on May 24. Starting in June, it was replaced with a new radio show hosted by Makino Maria. On May 27, Suzuki held her last fanclub event, titled Morning Musume '16 Suzuki Kanon FC Event. On May 31, Suzuki graduated at Nippon Budokan, and retired from the entertainment industry. Suzuki's mother is a piano teacher, her father is a security guard. She has one siblings: a younger sister, who is 5 years younger. She has a pet cat named Bii-san. After joining Morning Musume, Suzuki moved to Tokyo from her hometown. On December 18, 2013, Suzuki reported the death of her grandfather: Grandpa Mikkan's health had been deteriorating since the summer and he was eventually hospitalized. Grandpa Mikkan passed away at an undisclosed hospital surrounded by the Suzuki family. When she auditioned for Morning Musume, Suzuki was a 6th grade elementary school student. As of April 2017, she has assumedly graduated from high school. Suzuki most notably gets along with Sayashi Riho and their unofficial pairing name is SayaSuzu (さやすず). During rehearsals around the end of December 2014, Suzuki Kanon sprained her left ankle, tearing a ligament. As the injury took 6 weeks to recover, she did not participate in any of the Hello! Project COUNTDOWN PARTY 2014 ~GOOD BYE & HELLO!~ and Hello! Project 2015 WINTER shows. In addition, she could not appear in the dance shots of the "Seishun Kozou ga Naiteiru" and "Yuugure wa Ameagari" music videos, and was substituted by Juice=Juice member Miyamoto Karin. Suzuki played sports in school; she played 3rd base for her school's softball team, finished in 3rd place in the third-fifth grade marathon, and finished 6th place in the fifth grade marathon. Suzuki's given name, "Kanon", means aroma (香; ka) combined with sound (音; non). It's a common feminine and less common masculine Japanese given name. Zukki (ズッキ): Official nickname; given by Tsunku since the she debuted. Zukki-san (ズッキさん): Suzuki calls herself Zukki-san because she wants to be more mature. Kanon-chan (香音ちゃん): Nickname used by her fellow 9th generation members and fans. Kizzu (キッズ): Nickname given by Katsuta Rina. Favorite Phrase: "I'll manage somehow"
Favorite Morning Musume Songs: "Shabondama", "Kimagure Princess", "Onna to Otoko no Lullaby Game"
She ranked 2nd in a magazine's 2011 "Girls that seem like they'll become big stars in the future" ranking. She was voted 10th favorite member in the 2013 "Hello! Project Music Awards" event. She ranked 10th in BOMB magazine's 2013 "Breakout idols" ranking. 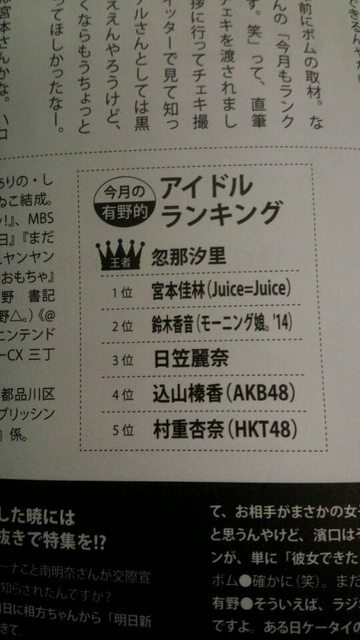 She ranked 2nd in BOMB magazine's 2014 "Breakout idols" ranking. 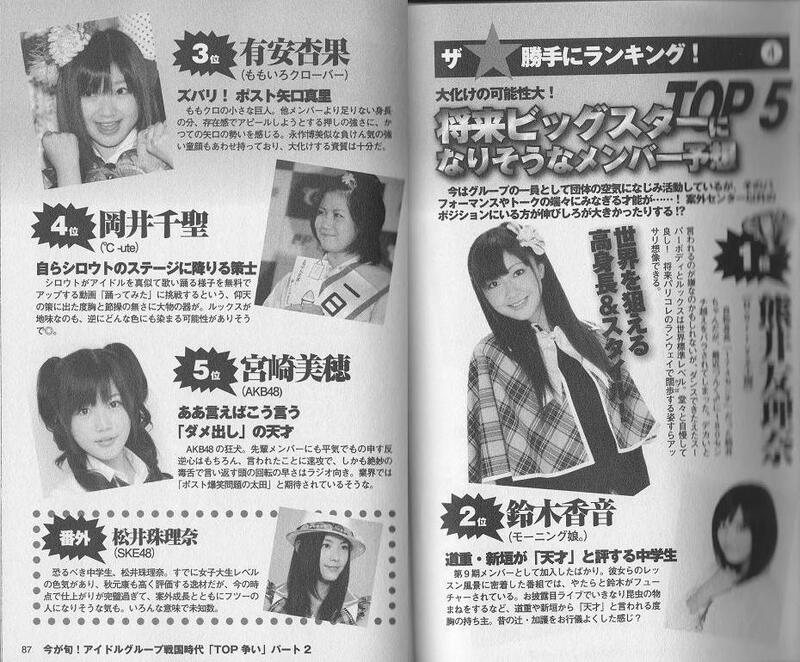 In a poll taken by J-MELO, she was voted 2nd most popular member of Morning Musume in foreign countries. She, along with Sayashi Riho, were the first members of Morning Musume that were born after the group's formation in 1997. Her weight has been a big topic among fans, in media and even inside Morning Musume '14 since mid-2012, when she began to gain weight rapidly. In a radio interview, she revealed that she has in fact been chubby for her whole life, but in prior to joining Morning Musume, she went on a diet and lost weight in order to audition for the group. When Berryz Koubou and Morning Musume were in the show Joy-sing, Suzuki won over Sudo Maasa. For the Morning Musume 9th Generation Audition, Suzuki's audition number was #320. She is the first Morning Musume member to be born in the Tokai region of Honshu. Her mother encouraged her to audition for Morning Musume. She had no dancing experience when she first joined Morning Musume. She is a fan of The Drifters, and her favorite members is Nakamoto Koji. After joining Morning Musume, she appeared in the newspaper of her prefecture on January 16, 2011. When she first joined, she was well known for her bug impersonations. She has said that when she gets older, she wants to learn foreign languages and travel around the world. When asked "if you could become another member of Hello! Project, who would you be? ", she said that she would be Tsugunaga Momoko. Michishige Sayumi has said that she wished she could be as pretty and sing as good as Suzuki. It has been said that Suzuki had the best control with pitches in her generation. Tsunku had said that if Suzuki kept improving, she could have became a main singer in the future. She passed her Morning Musume audition with a comedy routine. She said in her blog that she wears ponytails most of the time and for most of her life. Has said that she wants to take a trip to Brazil. She would want to be a nurse or a school teacher after her activities in Morning Musume. She loves to play Taiko no Tatsujin on her Nintendo DSi. She treasures her bear Chaa-chan. She keeps a picture of Mitsui Aika in her wallet. She along with Ishida Ayumi believes that Michishige Sayumi is the perfect idol. It is said that she sings so loudly that she doesn't need a microphone. Oda Sakura has stated that she gets alongs with Kanon best. She is currently practicing English using a software on her Nitendo DS. She posted on her blog that she took voice lessons with Oda Sakura. She says she hasn't watched any dramas since she joined Morning Musume. She likes Disney and often goes to the Tokyo Disney Land. She is a fan of Ojamajo Doremi and often talked about it in her blog, her radio show and in interviews. Her favorite character Segawa Onpu was her inspiration to become an idol. Tsunku commented on Suzuki: "Her character becoming quite stable these days... or maybe not. Maybe she's not fully there yet, the public doesn't know Suzuki's full potential yet, only 1/3 has become known so far. She probably knows this herself, as well, so with this upcoming single keep climbing!" ↑ "モーニング娘。9期10期メンバー Webトーク「本気DE飛跳！」（Vol.70）」本日21時より配信♪" (in Japanese). UP-FC. 2013-05-16. ↑ Suzuki Kanon. "大切な嬉しいお知らせ♪鈴木香音" (in Japanese). Morning Musume '14 Qki Official Blog. 2014-10-27. ↑ "モーニング娘。’16 鈴木香音に関するお知らせ" (in Japanese). Hello! Project. 2016-02-07. ↑ "モーニング娘。’16 鈴木香音に関するお知らせ" (in Japanese). Hello! Project Official Fanclub Website. 2016-02-07. ↑ 8.0 8.1 Concerning Kanon Suzuki from Morning Musume。’16. UP-FRONT LINK. 2016-02-06. ↑ "モーニング娘。’16 61stシングル『泡沫サタデーナイト！／The Vision／Tokyoという片隅』発売記念 鈴木香音 ソロスペシャルライブ決定のお知らせ" (in Japanese). Hello! Project. 2016-04-15. ↑ "泣いちゃうよね〜 鈴木香音" (in Japanese). Morning Musume Qki Official Blog. 2016-05-18. ↑ "公開録音 鈴木香音" (in Japanese). Morning Musume Qki Official Blog. 2016-03-22. ↑ "モー娘。’16鈴木香音 アイドル最後の日「私は世界一幸せ者です！！」" (in Japanese). Dwango.jp News. 2016-05-31. ↑ Suzuki Kanon. "鈴妹☆鈴木香音" (in Japanese). Morning Musume Qki Official Blog. 2012-10-27. ↑ Suzuki Kanon. "みっくんじぃちゃん、大大大好き！♪鈴木香音" (in Japanese). Morning Musume Qki Official Blog. 2013-12-18. ↑ Staff. "「モーニング娘。’14　鈴木香音・佐藤優樹に関するお知らせ」" (in Japanese). Morning Musume '14 Qki Official Blog. 2014-12-29. ↑ "MVに関するお知らせ 鈴木香音" (in Japanese). Morning Musume '15 Qki Official Blog. 2015-02-22. ↑ Miyamoto Karin. "鈴木さん。宮本佳林" (in Japanese). Juice=Juice Official Blog. 2015-02-22. ↑ 20.0 20.1 Michishige Sayumi. "新生モーニング娘。" (in Japanese). Michishige Sayumi Official Gree Blog. 2011-01-04. ↑ Fukumura Mizuki. "かのんちゃん☆譜久村聖" (in Japanese). Morning Musume Qki Official Blog. 2013-10-20. ↑ Sayashi Riho. "かのん県！鞘師里保" (in Japanese). Morning Musume Qki Official Blog. 2013-10-20. ↑ Ikuta Erina. "香音ちゃんと。生田衣梨奈" (in Japanese). Morning Musume Qki Official Blog. 2016-08-31. ↑ Takahashi Ai's Ameba Blog. Post Title "Morning Musume no Senaka"
↑ Unknown Magazine. Unknown Release Date. Reference Image. ↑ Hello! Project Music Awards 2013. Unknown Date. Reference Image. ↑ BOMB. Unknown Date. Reference Image. ↑ J-MELO. NHK World. 2014-05-20. ↑ Young Town Doyoubi. 2014-07-05. ↑ Suzuki Kanon. "おジャ魔女どれみ♪鈴木香音" (in Japanese). Morning Musume Qki Official Blog. 2013-08-21. ↑ Suzuki Kanon. "坊主が屏風でハイポーズ！あれ？♪鈴木香音" (in Japanese). Morning Musume Qki Official Blog. 2014-02-26. ↑ Itsudemo! Kannon Smile #11. CBC Radio. 2015-02-10. (Summary: "鈴木香音の「いつでもカンノンスマイル」第11回その2　（2/10）"
↑ "モーニング娘。'16鈴木香音卒業インタビュー" (in Japanese). Billboard JAPAN. 2016. 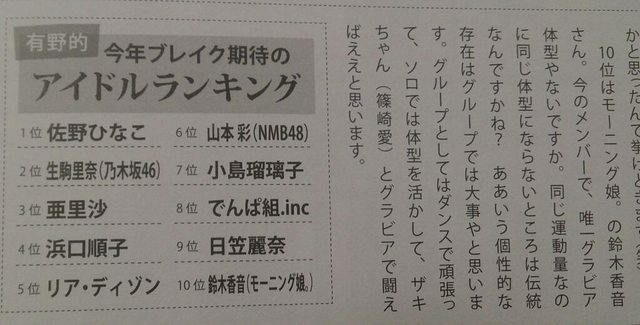 ↑ "Pocket Morning Weekly Q&A (6/17/2014)"
↑ "モーニング娘。'14 10/15発売シングル「TIKI BUN/シャバダバ ドゥ～/見返り美人」" (in Japanese). Tsunku Official Blog. 2014-08-28.